A couple of weeks back, I realized I posted my first entry on this blog February 2, 2009. It was sans picture or drawing. Just writing. Then it wasn’t until April that I actually began posting regularly. 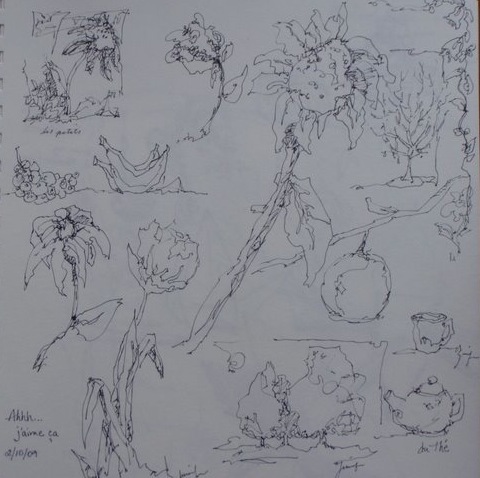 I remember wanting to get back into blogging, but still in a transition time where I was unsure of direction, experiencing a renewal of drawing and sketching. For a couple of years prior to this, I endured something of a creative crisis. I had been painting and drawing for 10 or 11 years, exhibiting, selling, schlepping my paintings hither and yon for shows, hosting shows in my home, etc. ; and I ran into a wall of sorts. Well, several walls. That would be a topic for another post, but suffice it to say, that my creative crisis found me picking up hook and needle more frequently. They became my new paintbrushes. I began teaching knit & crochet classes, and started my first blog. That’s right…before Drawn2Life, there was BagsoYarnBabe. This was a blogspot site whose title was suggested by my husband. He often feels like he lives in a house full of bags, boxes, and bins of yarn. And that, on top of paints, easels, sketchbooks, and all the accoutrements of a visual artist. I loved keeping this blog…more for myself than any other reason: to chronicle my journey with yarn and all the things I love about a life in yarn. To commemorate Drawn2Life’s anniversary, I’ve “slurped” in all the posts from BagsoYarnBabe for your perusal. The photos don’t quite work, but at least you can see them and read the posts. Just go to the Archives sidebar and click on months prior to February 2009. I’ve enjoyed memory lane. Towards the end of BagsoYarnBabe, in May of 2008, I was experiencing another creative upheaval, a good one this time. Mentioned here, drawing came back into my life. Oh, the bliss, the joy, of renewing a friendship I had let lie for a time. I was still discombobulated for a long time, trying to figure it all out, the whys of it all, the direction I was going, etc. This is my achilles heel: trying to figure it all out. If I could set that aside, try NOT to figure it all out, I would be much better off. So, Drawn2Life began. 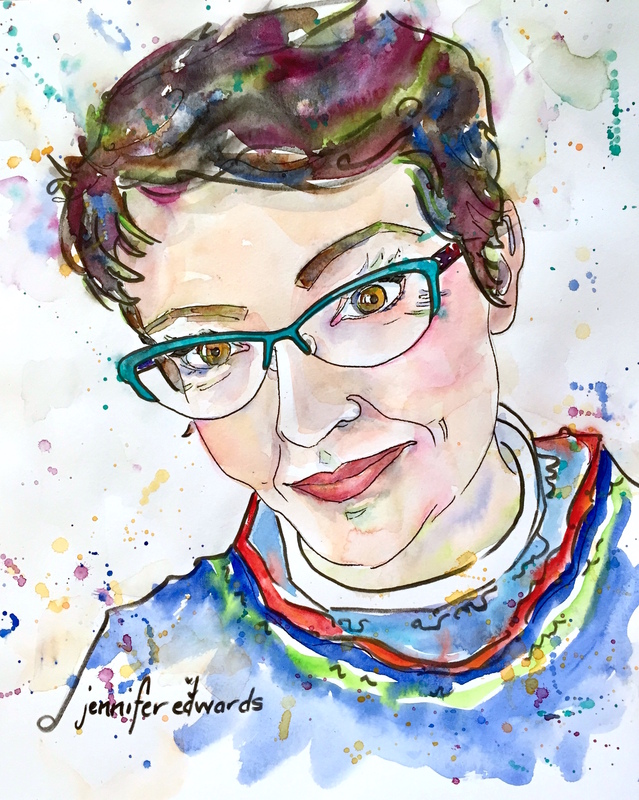 Many of you have seen that even this site has morphed…starting out strictly all things painting and drawing, and then evolving to include the yarn work. I feel there is a happy blend now. 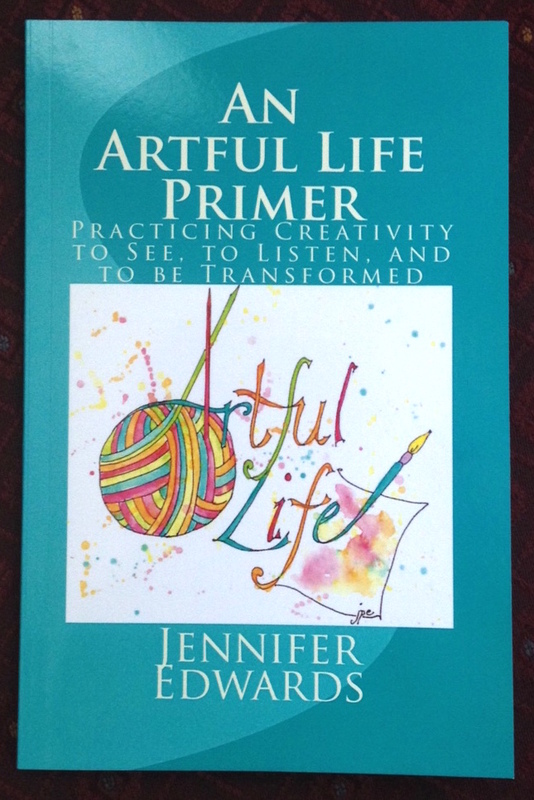 I rewrote my original artist statement to include the yarn work…they really are the same, drawing and knitting. It is line, all line. One is lines in pen, the other is lines in yarn…each line curving, twisting to make a pleasing whole. Drawn2Life seems a fitting title for my blog for it can really encompass so much! 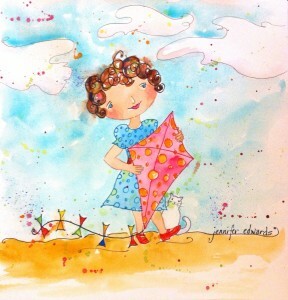 Wherever the “line” of my creative life takes me, I’m drawn to it! Who knows what creative paths I’ll take in the future? 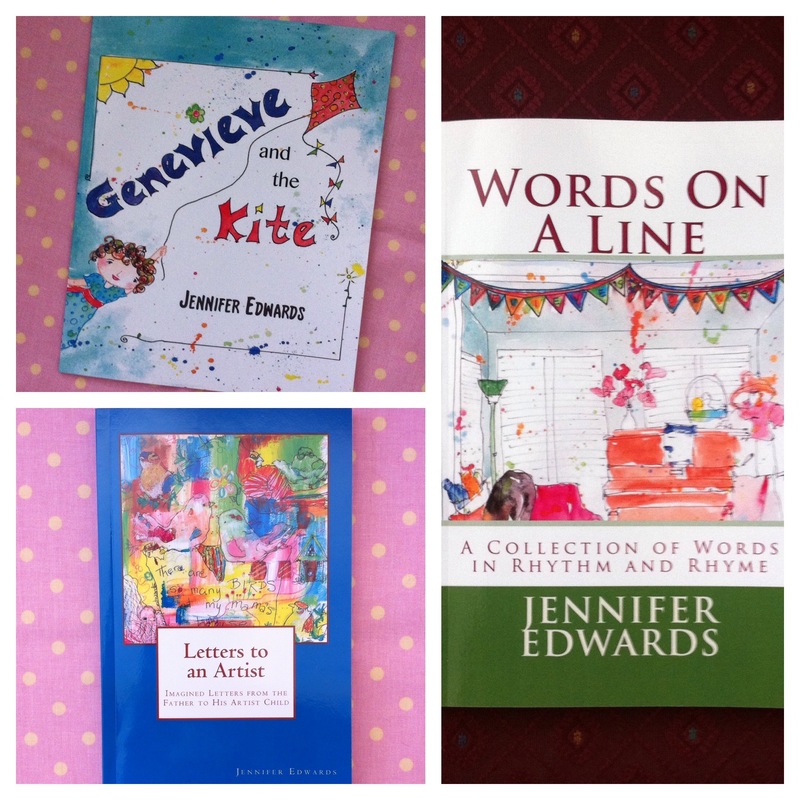 Right now, I’m content…content to let my creative work feed my daily life and vice versa. Thanks for coming along for the ride! P.S. The first image is a piece of freeform crochet I made a year or so ago…looks like an abstract painting doesn’t it? Happy Blog Anniversary! I enjoy seeing your beautiful work here whatever the material, it’s always inspiring to me! Congratulations! And I hope there will be many more years of creative growth ahead. 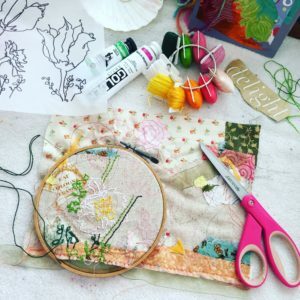 When I named my blog “PaperandThreads, I didn’t know where the balance between my sewing/quilting vs drawing/painting/bookbinding would be – or whether it would remain stable or cycle a little from time to time. Mixing dyes and mixing watercolor paints were so similar and like you said, a line is a line whether I make it on paper or fabric. But in January my circles really came together when I dye painted fabric, made it into book cloth, and made myself a new watercolor journal. I can’t wait to see what is next! I just need to keep reminding myself to remain open to new ideas and to keep stretching. Happy blogaversary! You’ve had an amazing creative life. The crocheted piece is lovely. Your path and mine have many similarities. 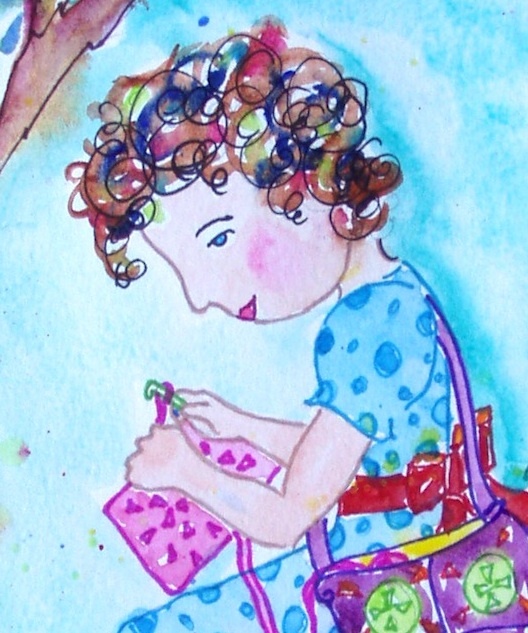 I avoided my love of drawing for years, hiding behind knitting, embroidery, teddy-bear designing . . . though I still enjoy those other pursuits sometimes, I am so thankful to have been brought back into drawing and now learning to paint. We need to rejoice in the gifts we were given! Happy Blogaversary! I, for one, am delighted that you’ve taken this direction. Everything here is beautiful, and well-thought out. I adore that page of sketches up there, with the nervous line. Stunning page! 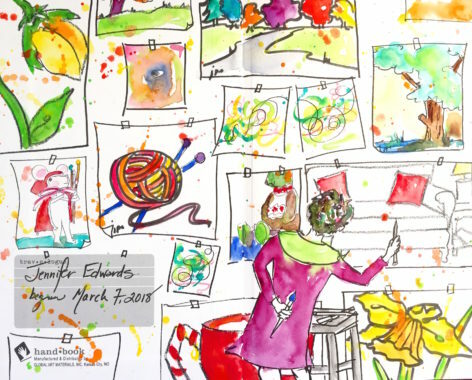 What wonderful lovely drawings – a truly super page! Happy anniversary! 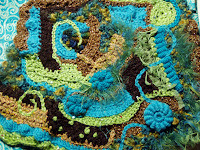 your yarn piece is full of texture and color–joyous to look at–wish I could feel it!